Each week as we discuss ETF progression, we note that client alignment growth factors like low cost, transparency, liquidity, and tax efficiency are driving asset expansion. As we come to the end of 2018, many asset classes have produced negative returns, prompting investors to “harvest” tax losses. With taxes in mind, in this week’s TETFindex update, we evaluate the tax efficiency of ETFs, tools for tax loss harvesting, and an ETF that embraces the anomalies created by loss harvesting. First and foremost, indexation has inherently less turnover than tactical active management. This concept goes back to the original efforts of indexing pioneers like John Bogle and Burton Malkiel. They postulated that the largest detractor to long term returns were cost, including the transactional friction and tax drag generated from high turnover. So, the alignment of ETFs with indexation is the first tax efficient aspect. Beyond the low turnover of indexation, ETFs have tax efficiency built into the structure. The “exchange traded” attribute of the ETF structure allows investors to purchase and sell shares without creating or redeeming small odd-lots. This is very different from mutual funds where every day mismatched buyers and sellers force transactions and tax implication in the underlying fund. The tax implications from these transactions become liabilities to those still hold the mutual fund shares. Furthermore, the creation and redemption process, which allows for in-kind transaction with Authorized Participants (APs) can further reduce the likelihood of creating a distributable capital gain in the ETF structure. Despite the tax efficiency of ETFs, the underlying assets they represent can have a bad year. 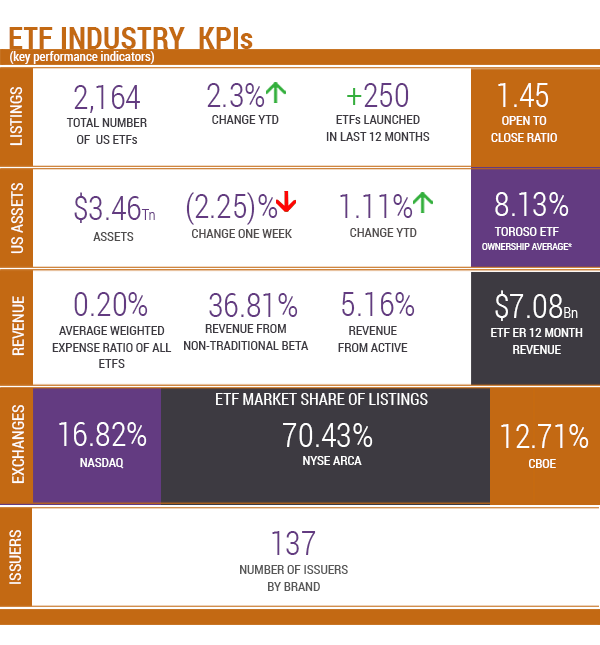 Investors looking to maintain exposure to certain themes can harvest the loss and then use our www.etfthinktank.com ETF Comparison Application to find an ETF with similar exposure and correlation. See the example below using VanEck Vectors Gold Miners ETF (GDX). One last thought on ETF tax harvesting and innovation; the Amplify Yieldshares High Income ETF (YYY) seeks to generate income from an index of the highest yielding closed-end funds (CEFS). The unique twist is that the reconstitution of the index is designed to coincide with tax loss harvesting season, which allows the fund to acquire new positions when they are historically trading at their largest discounts. A great example of how the ETF structure has transformed a dysfunction of CEFs into a positive. Tax efficiency and loss harvesting have become ETF client alignment growth factors that are usually just taken for granted. The ETF structure can produce a better after-tax return than a mutual fund following the same index! Simply put, a better structure is going to produce better results. Furthermore, the transparency of ETFs allows for intelligent tax swaps which can be found using our www.etfthinktank.com ETF Comparison Application. 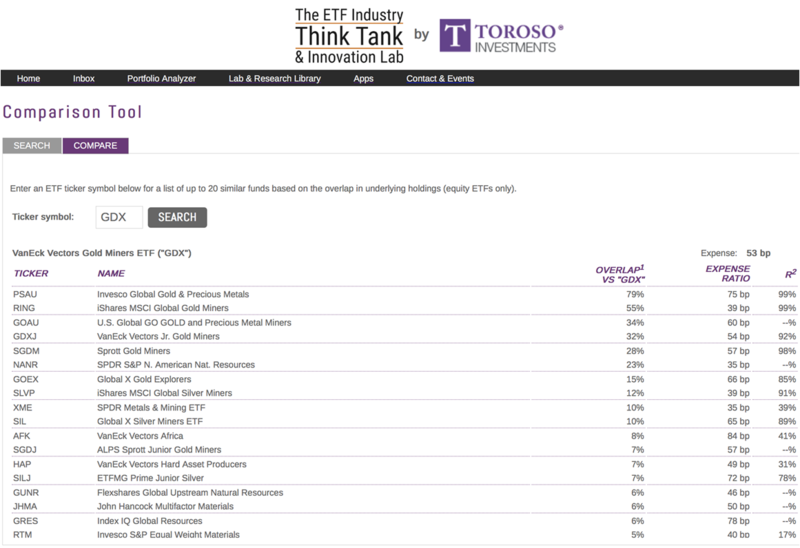 For more on ETF research and thoughts on ETF growth, please visit www.torosoam.com/service-tetf.php . Returns as of November 26, 2018. As of November 26, 2018. Source: Morningstar Direct.